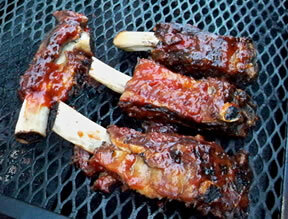 Wash ribs and wipe with a damp paper towel. Place in single layer in shallow roasting pan. Roast at 450 degrees for 20 to 30 minutes. To prepare sauce, sauté onion in butter until tender. Stir in flour and mustard. Cook 1 to 2 minutes. Stir in beef broth, lemon juice, chili sauce and black pepper. 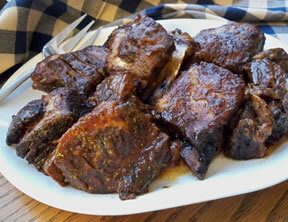 Cook 5 to 7 minutes or until sauce is smooth and thick. 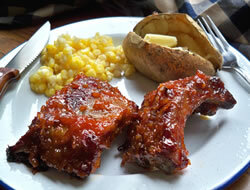 Brush over ribs, return to oven and bake 30 minutes or until tender, basting occasionally with sauce.